The calculations presented below follow the recommendations and tables from reference . The code calculates the thickness of the shielding necessary to reduce the exposure at levels permitted by regulations, for an X-ray source that can generate up to 300 keV. It is considered controlled areas with maximum annual exposure of 50 mSv or 20 mSv. For uncontrolled areas, a maximum annual exposure of 5 mSv and 1 mSv is considered. The maximum annual exposure of 0.05 mSv is added for ALARA considerations. The results are done for lead, concrete and drywall. The values for drywall are only approximated. For the total thickness of the secondary barrier, the following criteria are used: if the difference between the leakage thickness and the scattered thickness is lower than the TVL, then the total thickness is equal to the bigger of both values plus a HVL. If the difference is bigger than a TVL, then the bigger thickness will suffice. Controlled area = A defined area in which the exposure of persons to radiation is under the supervision of a Radiation Protection Supervisor (the area requires control of access, occupancy and working conditions). Uncontrolled area = an area to be occupied by public. Occupancy factor = Occupancy is the fraction, expressed as a percentage, of the time the area will be occupied while the source is on. a) Primary = barrier sufficient to attenuate the useful beam to the required degree. b) Secondary = barrier sufficient to attenuate the stray radiation (leakage + scattered) to the required degree. 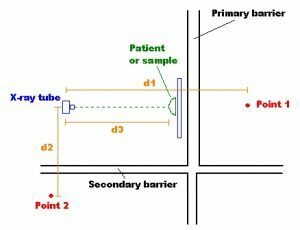 Usage factor = Fraction of the time during which the beam is directed to a particular barrier. d1 = distance between the irradiation source and the point of interest after the primary protective barrier. d2 = distance between the irradiation source and the point of interest after the secondary protective barrier. d3 = distance between the irradiation source and the patient or sample.